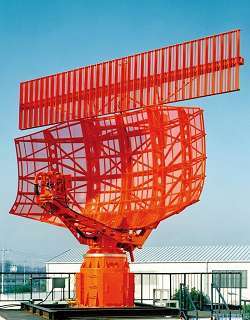 The ATC radar of the NEC Corporation, simply called ASR is a high performance, operating in classic S-Band Airport Surveillance Radar. It is designed to provide air traffic controllers with reliable and clear picture of air traffic within its coverage area. This ASR uses a dual beam antenna with a cosecant squared antenna pattern and a smaller one Pencil beam for low altitudes. There are a number of options for the fault-tolerant solid-state transmitter: Use of 16 to 90 standardized power modules for different requirements of the instrumented range of the radar. The primary radar may be provided with an additional LVA antenna intended for Mode-S capable secondary radar from NEC production.